Who receives the advantage in education? State or Independent pupils? Education is a powerful force in any nation. 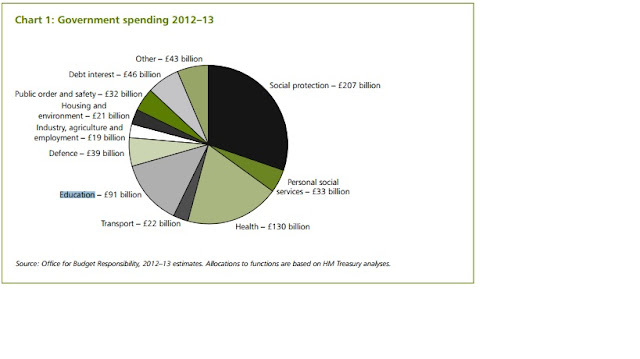 The chart below shows how much we are prepared to spend on it in the UK in 2012-13. Do we get value for money in education? How would we measure such an outcome? It could be the number of people going to University, the number of people not going to prison, the number of people paying the higher-rate of tax, etc. What we don't have is a consensus of what a good outcome in education is. My personal view is that it is to do with the number of exam passes that we achieve in the traditional subjects at the end of secondary education. This appears to be where the money is spent. One of the biggest expenses for a secondary school is exam entries. As such, the rest of this blog concerns secondary education in England as this is where my experience is. I do not know the inner-workings of school's finances but I do know how the independent sector differs from the state sector. And it is very, very surprising. If you have only had dealings with one type of education you would be forgiven for thinking that the business model is the same for all other types of education. This is where the privilege argument now begins. If you send your child to an independent school then many other people will assume that you have given your child an advantage against those in state education. The comments regarding better resources, smaller class-sizes, etc will continue to pour forth. But consider how hard state schools work to ensure that the pupils in their care achieve good exam results. In my experience, Independent schools will only allow a child to sit a GCSE exam at the end of 5th year (Y11) unless it is very clear that the child is ready to achieve a high mark as an early entry pupil. Independent schools tend to offer terminal courses (exams at the end of the course) rather than modular or unitised courses (exams sat throughout the course). The exam entries are normally paid for by the parents of the pupils rather than by the school. As such, a lower amount of exams and re-sits means that exam fees are not an outrageous expense for the independent pupils' parents. "Ensure that candidates are only entered for resits when it is appropriate." When I attended state school in the 1980s we had one shot at our exams. If you wanted to resit, say, Maths, you had to attend as a 6th former (meaning that you had to buy the 6th form uniform and behave like a 6th form pupil) and redo the exam in, I think, January. The exam demand for state school pupils has a much higher financial cost than it does for the independent school pupil. But the results outcomes for the school must surely be higher for the state sector compared to only entering pupils for exams at the end of Y11. If not, why would state schools be doing it? The fact that this practice hasn't been embraced by the independent sector suggests that it has flaws. The constant disruption in term-time due to exams being sat by various groups of pupils from Y9,10 and 11 must have a negative impact on the pupils' learning. This makes the probability of pupils under-achieving more likely. But state schools choose to do this. The cost must be quite considerable. "Ofqual found that £328.3m had been spent by English state schools on exams in 2010/11. This was up from £302.6m a year earlier and just £154m in 2002/3. The study revealed that exam fees made up 8.6 per cent of schools’ total running costs last year, compared with 7.8 per cent 12 months’ earlier and just six per cent eight years ago. It was the second biggest strain on running costs after “learning resources”, such as text books, said Ofqual. The rise comes despite a drop in the number of qualifications awarded last year, it emerged." Independent schools may seem to have all the privilege but state schools seem to have the deepest pockets when it comes to achieving exam success for their pupils. As the advert says, you don't have to be posh to be privileged.